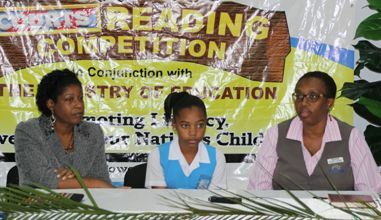 The 2014 staging of the Courts OECS Reading Competition is scheduled to begin tomorrow. The regional finals will take place in Grenada on October 16. At yesterdayâs launching ceremony, Courts St Vincent senior manager Michele Samuel said that Courts, along with partners SEARCHLIGHT Newspaper, LIME, CK Greaves, Multigraphics and Professional Dental Services, will offer a number of attractive and exciting prizes for the winner, as well as the other participants. Courts has been partnering for the six years of the competition with the Ministry of Education, whose representative at the launch, Mavis Joseph, said that the initiative is an invaluable one that helps to encourage literacy in St Vincent and the Grenadines. âWe are encouraged that you have decided to continue to partner with us to promote literacy skills among the primary school students of our nation. âThis competition, held annually, will in due course boost the overall development of reading andâ¦ we are therefore grateful to Courts and all the other sponsors for once more providing our children the chance to expose and develop their reading abilities. During the competition, the students read will two passages; both would be unseen until they are ready to read. One will be in the form of a narrative or story, while the other would be a news item. Each student will be given one minute to peruse each passage before reading. Joseph said that the competition will access reading fluency, accuracy, enunciation, confidence and expression and is open to all primary schools throughout St Vincent and the Grenadines.